The histaminergic neurons of the posterior hypothalamus (tuberomamillary nucleus—TMN) control wakefulness, and their silencing through activation of GABAA receptors (GABAAR) induces sleep and is thought to mediate sedation under propofol anaesthesia. We have previously shown that the β1 subunit preferring fragrant dioxane derivatives (FDD) are highly potent modulators of GABAAR in TMN neurons. In recombinant receptors containing the β3N265M subunit, FDD action is abolished and GABA potency is reduced. Using rat, wild-type and β3N265M mice, FDD and propofol, we explored the relative contributions of β1- and β3-containing GABAAR to synaptic transmission from the GABAergic sleep-on ventrolateral preoptic area neurons to TMN. In β3N265M mice, GABA potency remained unchanged in TMN neurons, but it was decreased in cultured posterior hypothalamic neurons with impaired modulation of GABAAR by propofol. Spontaneous and evoked GABAergic synaptic currents (IPSC) showed β1-type pharmacology, with the same effects achieved by 3 μM propofol and 10 μM PI24513. Propofol and the FDD PI24513 suppressed neuronal firing in the majority of neurons at 5 and 100 μM, and in all cells at 10 and 250 μM, respectively. FDD given systemically in mice induced sedation but not anaesthesia. Propofol-induced currents were abolished (1–6 μM) or significantly reduced (12 μM) in β3N265M mice, whereas gating and modulation of GABAAR by PI24513 as well as modulation by propofol were unchanged. In conclusion, β1-containing (FDD-sensitive) GABAAR represent the major receptor pool in TMN neurons responding to GABA, while β3-containing (FDD-insensitive) receptors are gated by low micromolar doses of propofol. Thus, sleep and anaesthesia depend on different GABAAR types. 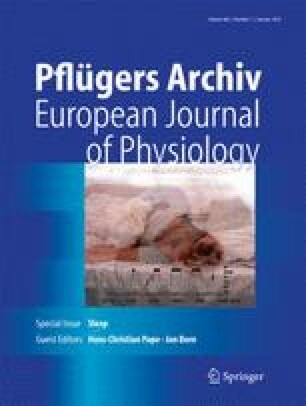 This article is published as part of the Special Issue on Sleep. Supported by Deutsche Forschungsgemeinschaft SFB 575/3 and 8 and a Heisenberg stipend to OAS. We are grateful to B. Görg for the help with confocal microscopy.